Firstly, consider going to the salon for your first bleach job- and then you can just touch up the roots yourself. Usually a salon will know what they are doing a lot more than you will, and it's easier for someone else to do your whole head than it is for you. (I personally had a bad experience with this though, I had a hairdresser who had never bleached hair before-eek!) Make sure to get a consultation beforehand when you can talk about price and show pictures of what you're aiming for. After that, you can maintain it by touching up your roots yourself. Research a lot! Make sure you read up on how to bleach hair, and watch a tonne of youtube videos too. Knowledge is power, and the more research you've done, the less likely you are to have any mishaps. But on to the actual bleaching part. Give yourself enough time, so you're not rushed. Make sure you are in a well ventilated place it needs to be warm, but crack open a window or you'll be inhaling bleach fumes, mmm. Remember that bleach does make your scalp tingle a bit, but it shouldn't be painful. Try and angle two large mirrors so you can see the back of your head- you'll be less likely to miss patches. The first time you bleach your roots, using a kit like Schwarzkopf or Bleach London might be easier as the powder and developer is already measured out for you. They usually come with a good deep conditioning mask too. FOLLOW THE INSTRUCTIONS AND DO NOT LEAVE IT ON LONGER THAN YOU ARE MEANT TO. Once you are more confident, buying developer and bleach powder separately in larger quantities saves a tonne of money. At my local hairdressing supplies shop, I bought this huge tub of bleach powder for £4.35, and the developer was £9.99. I bought the tint brush and bowl for about a pound each from there too. If your roots are yellower than you'd like, use a white toner or silver shampoo to get some of the brassier tones out. If they're too orange, you may have to bleach them again though. 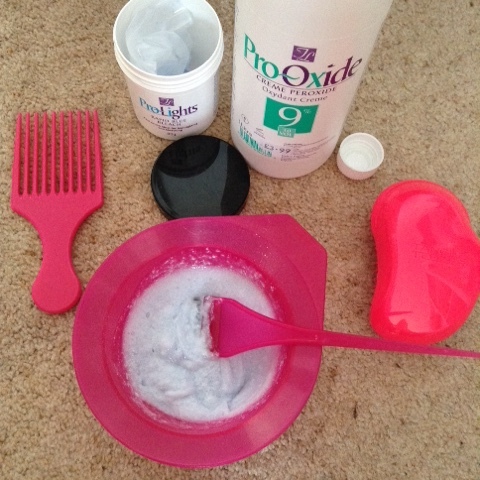 After you've bleached, use a hair mask for as long as you can- I like to leave an hour or two aside for this. I pop a shower cap over the top so it doesn't go everywhere. You can go natural with coconut or argan oil, or use something like tressemé, bleach london's resurrection mask, or Herbal Essence's Bee strong mask. If you miss a little patch, don't panic! Either bleach it separately in a couple of days, or just don't bother- your roots will grow out soon enough and it won't notice. If you need to bleach your hair twice to get your desired colour, wait a little while in between bleaches to give your hair and scalp time to recover. Try for a few days to a week. Wait until you have about half an inch to an inch of regrowth before bleaching again- I do my roots about every one to two months. Learn to love your roots. It's grunge, people. Don't leave too long in between touch ups though- this can increase the risk of banding in the bleach, as the section nearest your scalp will be warmer and will bleach better.